UPDATED: Sat., July 14, 2018, 9:50 p.m.
1. (1) Martin Truex Jr, Toyota, 267 laps, 60 points. 2. (7) Ryan Blaney, Ford, 267, 50. 3. (4) Brad Keselowski, Ford, 267, 34. 4. (5) Kyle Busch, Toyota, 267, 50. 5. (3) Kevin Harvick, Ford, 267, 48. 6. (9) Kurt Busch, Ford, 267, 35. 7. (2) Erik Jones, Toyota, 267, 32. 8. (12) Aric Almirola, Ford, 267, 31. 9. (18) Kyle Larson, Chevrolet, 267, 37. 10. (19) Joey Logano, Ford, 267, 30. 11. (6) Paul Menard, Ford, 267, 33. 12. (8) Clint Bowyer, Ford, 267, 35. 13. (16) Chase Elliott, Chevrolet, 267, 25. 14. (27) Jimmie Johnson, Chevrolet, 267, 23. 15. (11) Daniel Suarez, Toyota, 267, 26. 16. (36) Denny Hamlin, Toyota, 267, 21. 17. (22) Jamie McMurray, Chevrolet, 267, 20. 18. (24) David Ragan, Ford, 267, 19. 19. (17) Matt Kenseth, Ford, 267, 18. 20. (21) William Byron, Chevrolet, 267, 17. 21. (10) Ryan Newman, Chevrolet, 267, 16. 22. (13) Austin Dillon, Chevrolet, 266, 15. 23. (20) Chris Buescher, Chevrolet, 266, 14. 24. (23) Michael McDowell, Ford, 266, 13. 25. (29) Kasey Kahne, Chevrolet, 266, 12. 26. (14) Ricky Stenhouse Jr, Ford, 266, 11. 27. (25) Bubba Wallace, Chevrolet, 264, 10. 28. (30) Ross Chastain, Chevrolet, 263, 0. 29. (28) Ty Dillon, Chevrolet, 263, 8. 30. (26) AJ Allmendinger, Chevrolet, 262, 7. 31. (31) Corey Lajoie, Chevrolet, 260, 6. 32. (34) BJ McLeod, Chevrolet, 256, 0. 33. (33) Landon Cassill, Chevrolet, 256, 4. 34. (39) Timmy Hill, Ford, 254, 0. 35. (38) Jesse Little, Toyota, 253, 0. 36. (35) Garrett Smithley, Chevrolet, 251, 0. 37. (37) Matt DiBenedetto, Ford, vibration, 200, 1. 38. (32) JJ Yeley, Toyota, engine, 199, 0. 39. (15) Alex Bowman, Chevrolet, accident, 108, 1. Average Speed of Race Winner: 150.450 mph. Time of Race: 2 hours, 39 minutes, 43 seconds. Margin of Victory: 1.901 seconds. Caution Flags: 4 for 22 laps. Lead Changes: 14 among 7 drivers. Lap Leaders: M. Truex Jr. 1-37; B. Keselowski 38; R. Blaney 39; Kurt Busch 40-60; J. Logano 61-62; A. Bowman 63; J. Johnson 64-66; M. Truex Jr. 67-84; J. Logano 85-87; Kurt Busch 88-97; M. Truex Jr. 98-163; B. Keselowski 164-200; M. Truex Jr. 201-209; Kurt Busch 210-223; M. Truex Jr. 224-267. Leaders Summary (Driver, Times Lead, Laps Led): M. Truex Jr. 5 times for 174 laps; Kurt Busch 3 times for 45 laps; B. Keselowski 2 times for 38 laps; J. Logano 2 times for 5 laps; J. Johnson 1 time for 3 laps; A. Bowman 1 time for 1 lap; R. Blaney 1 time for 1 lap. SPARTA, Ky. – No matter which driver led Martin Truex Jr., the advantage always seemed temporary as he positioned himself to make a pivotal move. Truex’s No. 78 Toyota Camry appeared even more dominant than last July as he led five times for 174 of 267 laps and swept the first two stages from the pole. The defending Cup champion was always in contention in the 400-mile race, even while trailing. He proved it at clutch moments late, overtaking Keselowski on lap 201 and Busch 23 laps later to become Kentucky’s first back-to-back winner, earning his fourth victory this season and 19th of his career. His competition certainly couldn’t hold him off. “We had better speed than we’ve had at mile-and-a-halves, but not enough to run with the 78 (Truex),” said Keselowski, who led twice for 38 laps. Dominant as Truex was here a year ago in leading 152 of 274 laps, Busch and Keselowski still loomed as favorites after combining for five victories in the previous seven races. Keselowski’s knack for winning this race in even-numbered years was particularly compelling, and for a moment it looked like he might do it again with a bold rush off pit road to claim the lead entering the final segment. 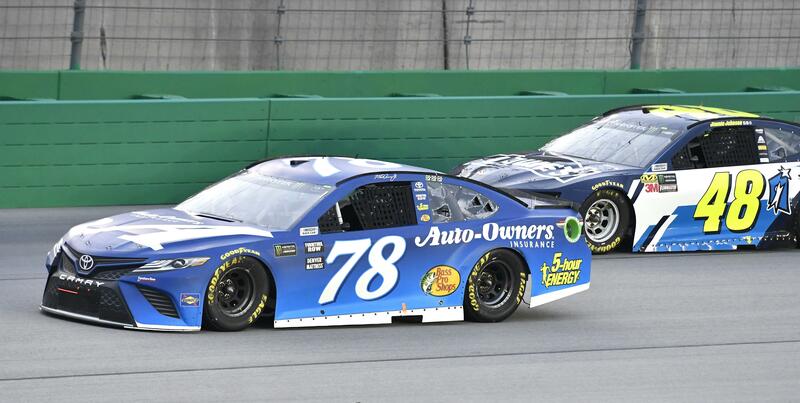 Truex’s dominant run to victory last July provided an opening some hoped might expand membership in Kentucky Speedway’s exclusive winner’s club. He turned out keeping things the same by taking control when he wanted. It was that way all night for Truex, who led 51 laps to win the first stage and led 118 after claiming the second. Even when he trailed, it wasn’t by much as he stayed close enough to make a run. Just seven drivers led overall, with 10 laps divided among four drivers. Rounding out the top 10 were Kurt Busch, Erik Jones – who started second in a Toyota – Aric Almirola, Kyle Larson and Joey Logano. Kurt Busch led three times for 45 laps. The race featured just four cautions for 22 laps, the first coming after Alex Bowman’s No. 88 Chevy hit the turn 3 wall. He was unhurt and suggested that a broken brake rotor might have been the problem. The series heads to Loudon, New Hampshire, on July 22 for its lone New England stop. Denny Hamlin won last year’s 301-mile race. Published: July 14, 2018, 8:25 p.m. Updated: July 14, 2018, 9:50 p.m.